I like to make this with milk powder instead of milk, so that I can add more milk powder to get the required thickness. It also reduces my cooking time. Coarsely powder Almond, cashew nuts & pista. Boil the milk in a thick bottom pan with medium flame. Add almond powder, cashew nut powder & pista powder. Note: Adding almond powder makes milk thick & also gives good taste. 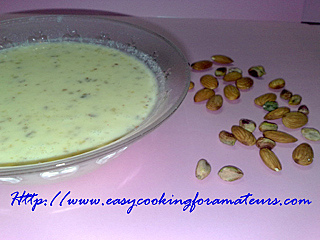 Stir till milk reduces to half or becomes thick enough. Add sugar, saffron & stir for 5 more minutes. Coarsely grind cardamom & add to milk. Mix well & switch of the stove. Refrigerate & Serve it chilled. 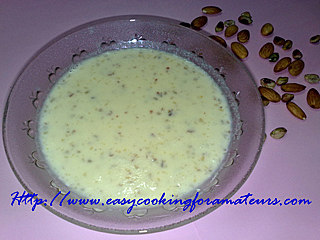 Note: Basundi will be pouring consistency when it is hot. It gets thick when it cools down. Did I just write rice? I meant milk. You too have a nice space..............all the best.